Born in the Los Angeles area on November 21, 1926. Named Calvin Charles Green. Due to the depression in 1929 was placed in an orphanage in Los Angeles. Spent 10 years there till moving to the Bakersfield area and adopted as Calvin Charles Emerson. 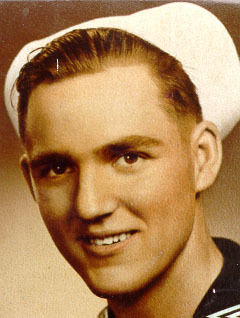 Went to High School for three years and then enlisted in the Regular Navy in June 1944. Went to San Diego for Basic training, and Class A gunnery school, then to Camp Shoemaker for assignment to the USS BANCROFT DD-598. Went on many ships chasing the BANCROFT over the South Pacific. Went on board the BANCROFT at the Island of Moritai near Borneo. Stay on board the BANCROFT till the end of the war. Brought her home to the East Coast and finally put her out ofCommission in Charleston, S. C. Had my left hand blown apart when working on a 5.38. At Great Lakes was for a year, and then another year teaching and constructing the school. Returning To Charleston, being discharged from there on the 14 of July 1950. When arriving home, I joined the Kern County Sheriff Office, doing all the things that pertain to that job, working up to being in charge of the Transportation and Court Detail. Retired in July 1983. After retirement, I worked for the Office as a Search and Rescue officer. Main duty was river and mountain Rescue. 1992 retired again. Member of the USS BANCROFT DD-598 reunion assoc, as President and founding member. Member of the NAVY LEAGUE, on the local board, and Liaison Officer with the CG Cutter CHASE. Member of the FLEET RESERVE ASSOC., I am the Chair of the restoration committee of the 37' 1 1" model of the Battleship ARIZONA BE-39. Member of AMERICAN LEGION, VFW, NAVAL MEMORIAL, WW II MEMORIAL.